Plenty of time. Not nearly enough time. Tick, tock, round like a clock. Going back to 1937 again today, but only for a moment. We know it wasn’t the mile and not sure if they contested the 1500 back then but what isn’t in question was that a stellar performance was recognized and appreciated. Nice that it is in Pete’s possession now. Back to the relative future. Late 1970s to be exact, Houston. 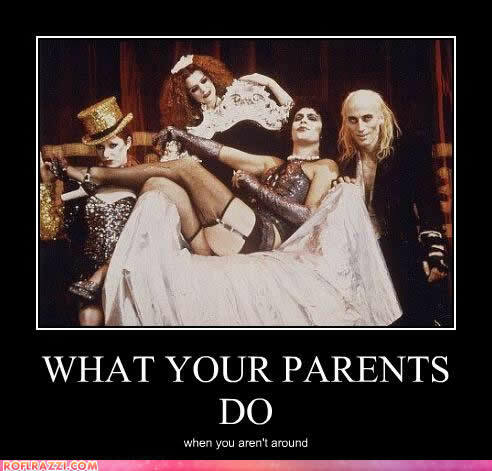 At least once a month I’d head downtown to the Alabama Theater for the midnight showing of “The Rocky Horror Picture Show.” It was a must for all the young, healthy, alternative boys and girls. If you’ve never experienced it you need to take a walk on the wild side. 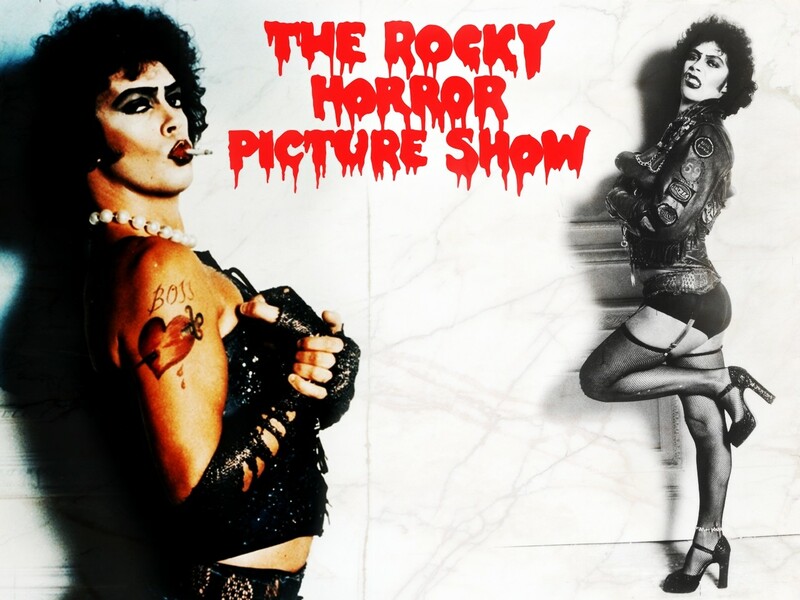 Although the Alabama closed in the early 80s Rocky Horror still shows monthly at the River Oaks Theater. What has made this one of the hippest happenings in Houston is the simultaneous “shadow casting”. Most all in attendance are in their favorite character’s costume and have memorized the movie line by line. It’s a Real Time thing that gives you chills and thrills. Tim Curry stars as the Transsexual Transvestite from Transylvania, looking much better in heels than I ever did (actually I was pretty close.) 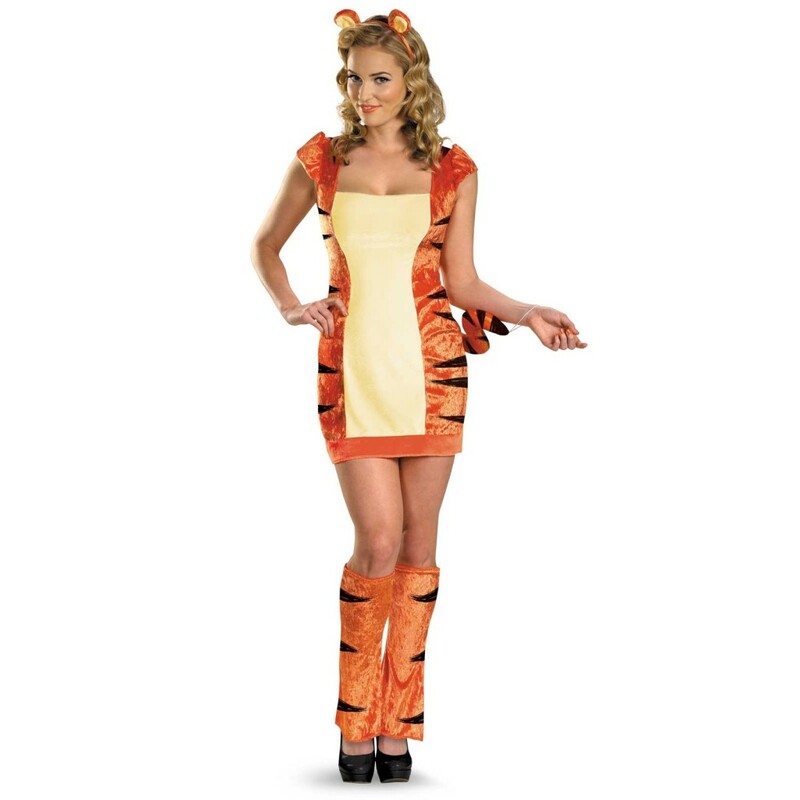 Always one of the most popular Halloween costumes in America’s 4th largest city. And once a year, one of my favorite memories, think I’ll break out the fishnets tonight…. This entry was posted in Uncategorized on October 31, 2013 by runguru. We’ll be turning back the clocks this weekend. I find the whole arrangement ridiculous if not suspicious. Tampering with the natural rythms and rhymes of the citizenry. I’m not much of a conspiracy theorist but this one has always left me scratching my head. This is a good segue. I’ve been waiting to detail a little history of Our Little Slice so lets turn back the clocks to the mid 1930s. 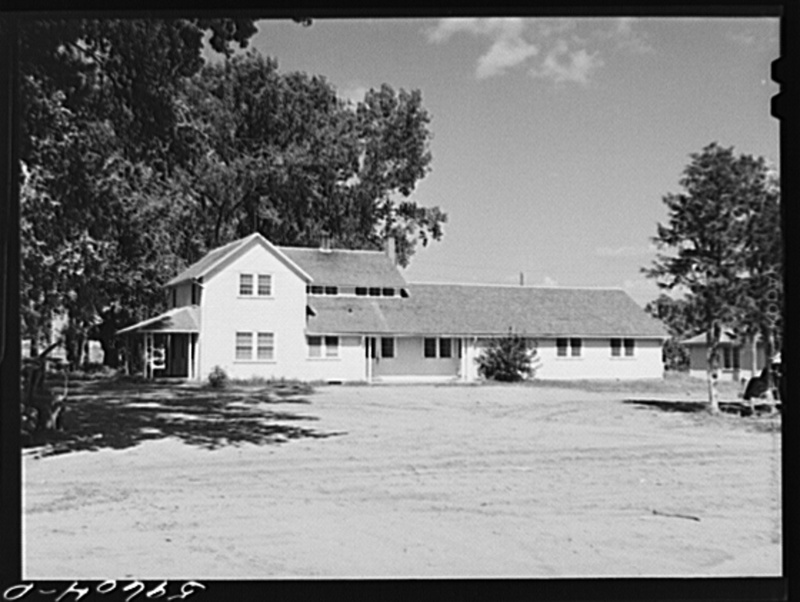 The Farm Security Administration (FSA) under the guidance of Rexford Tugwell (ain’t that a name!) 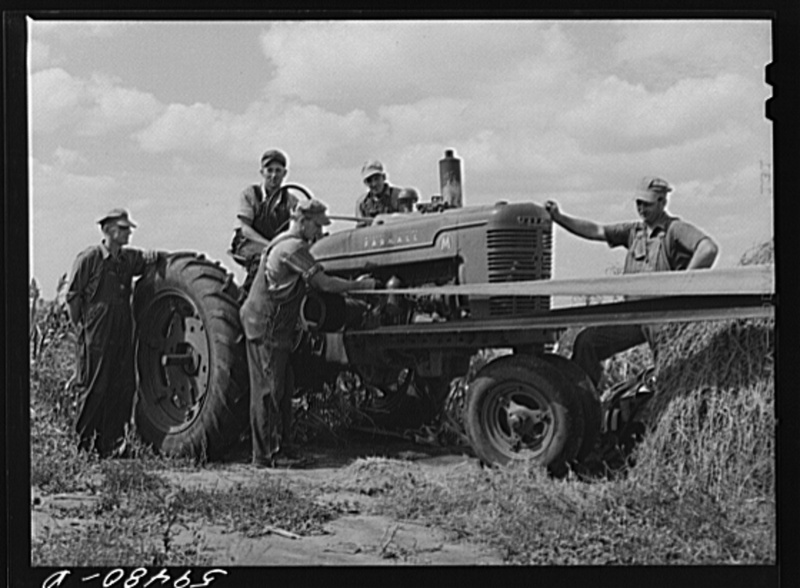 set up homestead cooperatives in Waterloo, Falls City, Loup City, Kearney, Fairbury, and Scottsbluff. 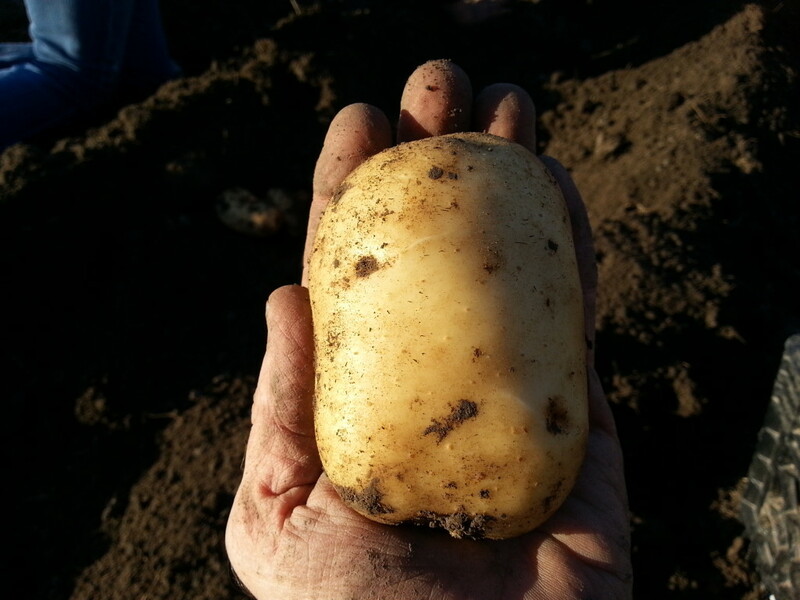 The homesteaders were given 7-10 acres and assigned a particular contribution to the Overall Good. 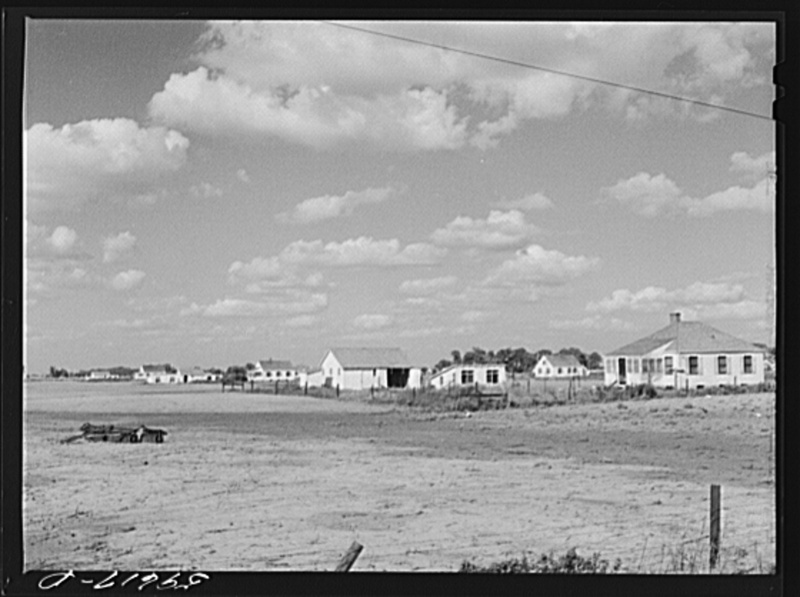 One house was a blacksmith, one was a plumber, one a mechanic, etc. 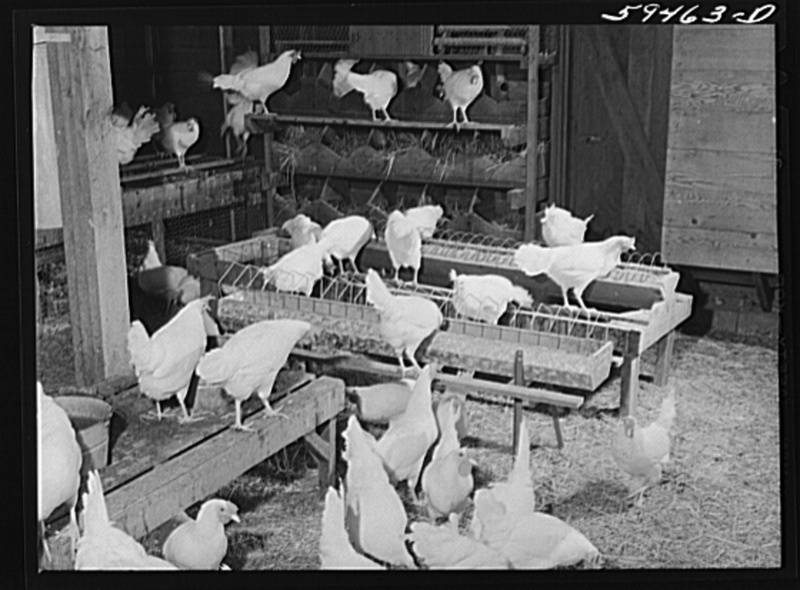 All were gardners and raised some form of livestock, primarily chickens and cows. Communism? Yep. Here in Waterloo there were 10 original homes. I’m in one of them. You see the same original footprint even though all have been updated/remodeled. The building that fascinates me the most and indeed initiated my research is the Dining Hall. It still stands. All meals were provided communal style with everyone gathering thrice daily for sustenance. I’d love to tour the old structure, understand that it is currently being used for storage by the property owner. The old dining hall then. Looks much the same today. 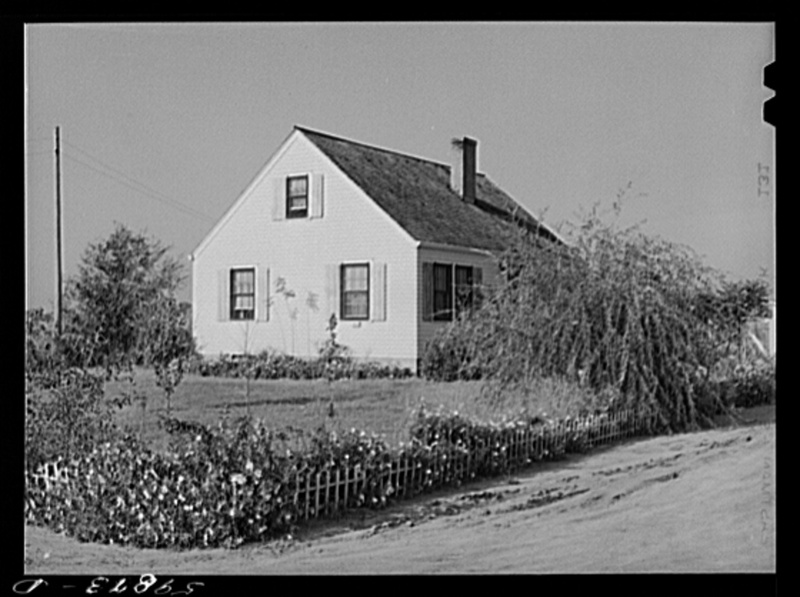 The original form of the the homesteads. They appear very similar today with updates- and paved roads to boot. 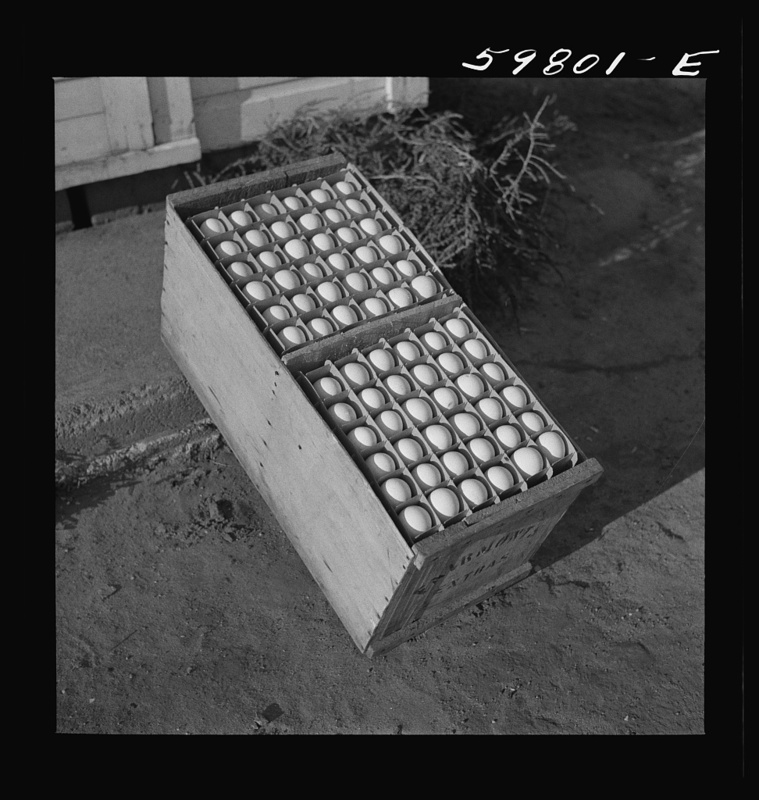 The co-op provided fresh eggs for much of Omaha. 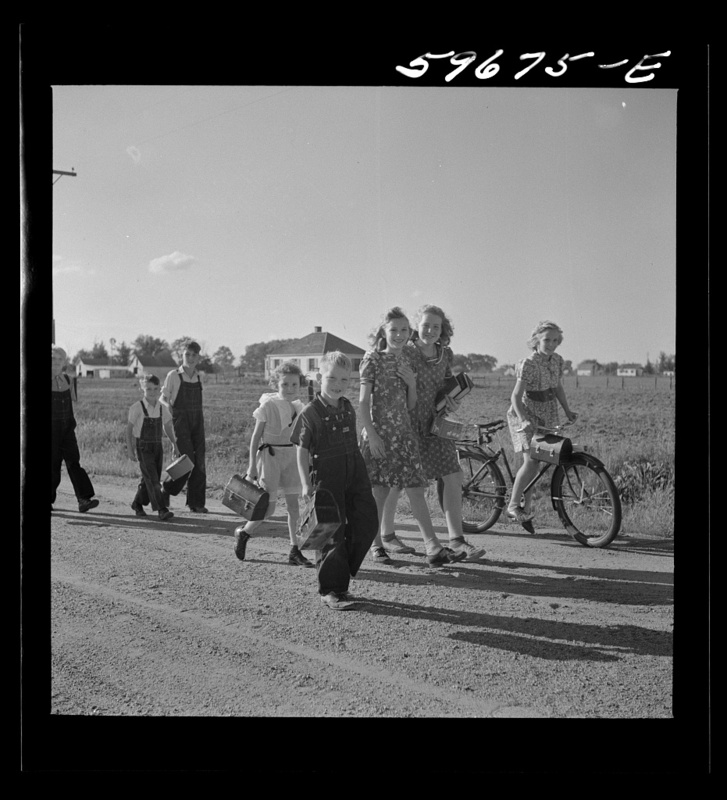 Most of these kids now have grandchildren and great grandchildren of their own. I doubt very much that designer labels were uniform of the day. A simpler time and that spirit still resides within those of us seeking it. This old Farmall tractor was a workhorse. As were the men. As am I. Our Little Slice. Now blessed with Maple and Ash and Pine and Cottonwoods and myriad variety of Oak and more. 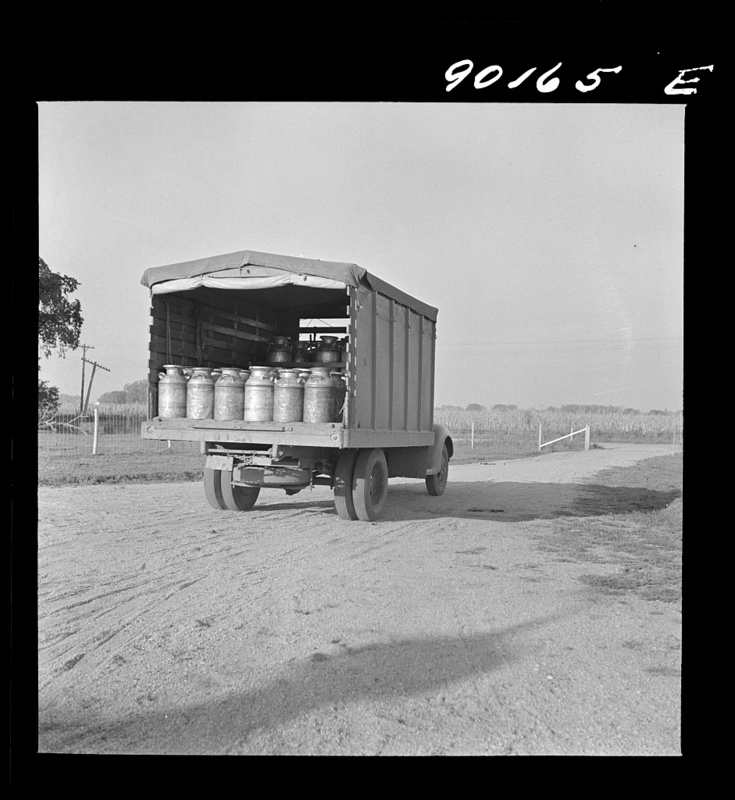 All photos courtesy of the Farm Security Administration. 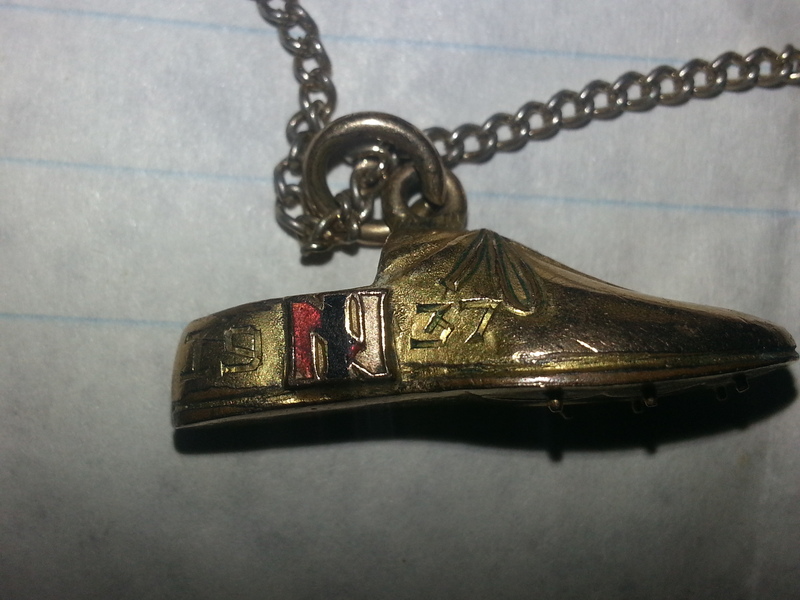 I’ll be turning back my favorite wrist watch this weekend. 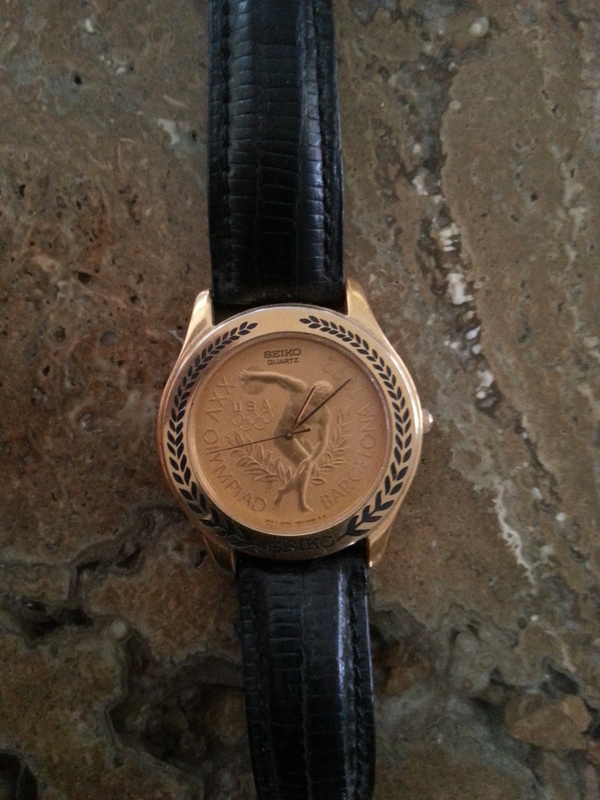 This special edition Seiko commemorating the 1992 Barcelona Olympics. 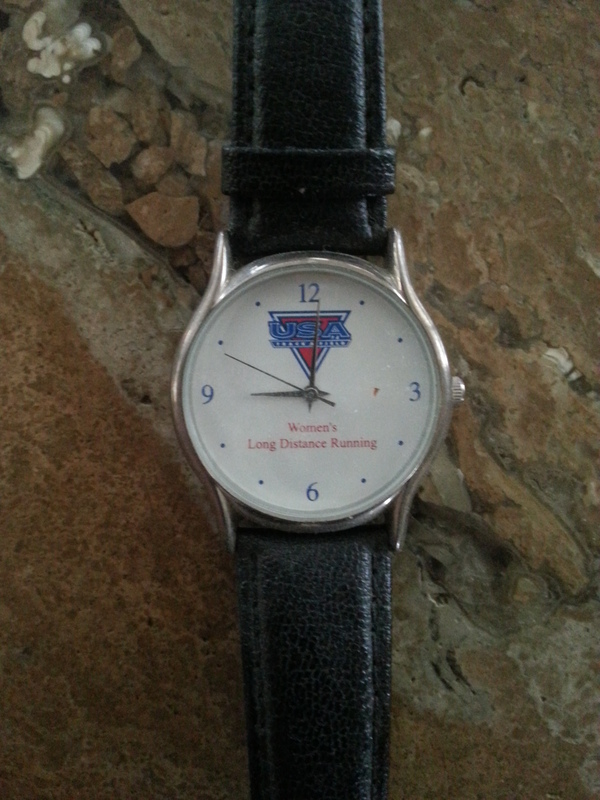 And this one from USATF that I received for my service to Women’s Long Distance Running. This entry was posted in Uncategorized on October 30, 2013 by runguru. Fast on the heels of being named the 8th Most Challenging Trail Run in the United States by Business Insider Magazine. The 2014 edition will be held on Saturday, April 5th. My birthday is on Thanksgiving Day this year. In celebration and to kick off registrations I have set up a special “Birthday” entry fee through the month of November only. All registrants through the month of November will enjoy the low registration rate of $30. Entry fees will increase to $35 on December 1st. Another increase to $40 will occur on January 1st, where it will remain until March 1st when it raises to $45. It will remain at $45 until the final increase on race morning to $50. 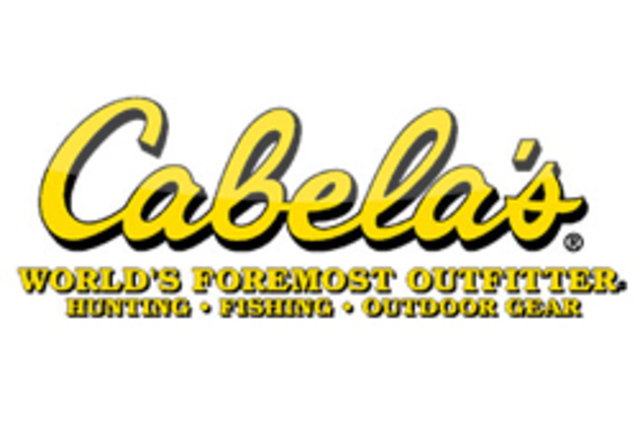 Save yourself some bucks by going to www.active.com keyword: Ni-Bthaska-Ke and register today! We will keep the Tough Little Mudders entry fee at our standard $15. New this year is a big thank you to our active military. A special discounted rate of $25 is available to all the good men and women currently serving. This price break will remain in effect through race day. Please contact our Offutt Liaison Walter Key at walter.key@gmail for further information. This entry was posted in Uncategorized on October 29, 2013 by runguru. This morning’s race recap from our NRGE Ultra field correspondent Pete Kostelnick. Good job too by David Bohlken on taking the overall in the 10.5 mile. More complete results as they come available. Congratulations to Race Director Scott Giddings and his organizing committee on a job well done. Being an aficionado and critic I deem these very sweet awards. Giant Killer! Peace. Love. Run. NRGE. Thoroughly enjoyed Saturday, long as it was. After winding up out at Vala’s I came home and began cooking for the 30 or so people that were celebrating the perfect fall day with country cooking and a hell of a bonfire. An eclectic mix. Line of the night came after I described the communal origins of Our Little Slice, Tom Whitaker suggesting I should have named the Bar None, Will Henge instead. I like that. And how I spent my Sunday afternoon. 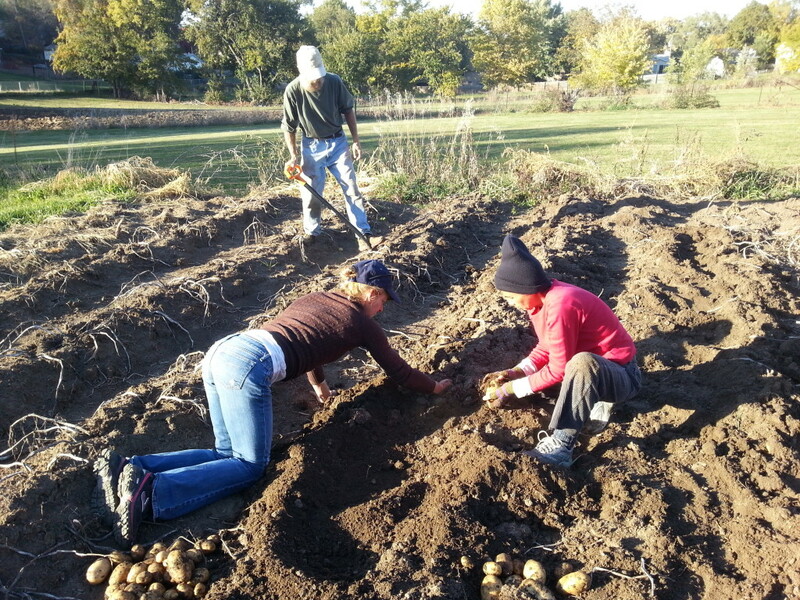 Digging potatoes on a perfect afternoon. 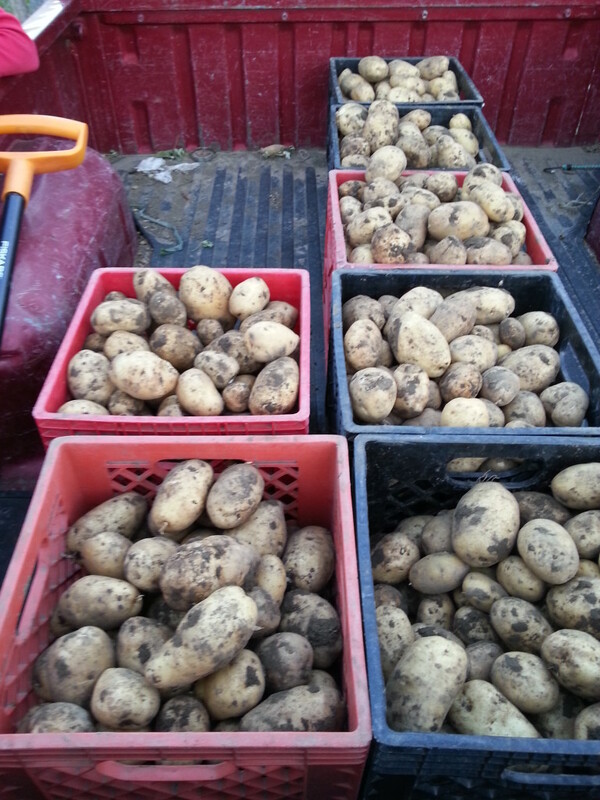 Good hard working women and men enjoying the bounty of our Good Mother. Beautiful Kennebecs, sweet and tender, just like my Linda! Half this bounty now safe and snug in the fruit cellar. This entry was posted in Uncategorized on October 28, 2013 by runguru. Thanks to Tom Whitaker and the Omaha Running Club for the big assist this morning. He and wife Lorraine are timing and results treasures. Luka Thor sleepwalked a 17:53, appropriately enough after working the midnight shift last night. A real battle between Nate Stack and Jimmie Doherty for the bragging rights of being next. They were fast on the dozing Thor’s heels with Nate awarded the same time in 17:53 and Jimmie 17:54. NRGE mate Walt key hung with the young Team Nebraska trio before being gapped midway into the second loop. He would finish in a nice 18:12, a solid time on this frighteningly hilly course. Team Nebraska’s Bob Miyake was 5th in 18:41. Also representing Team Nebraska, and a pretty nice fella, Steve Cross took the Champs Masters kudos, 6th overall in 21:44. Walt’s mate and our Hope From The West Scottie Shaw took the women’s USATF Nebraska Association 5K XC crown with her 22:27 good enough for 7th overall. Tammy Consbruck (2nd o/a female, 22:55) showed she has strength as well as speed, she didn’t miss a Wednesday Night Track all year. Shannon McEvoy rounded out the top 3 women in 24:28. Christine Miyake was the top masters female taking home a prized custom decorated skull for her 26:02. The top 10 men and women were awarded, we hope they are some of the coolest and ghoulest of the season. Thanks again to Agustin Delgado and Dan Knobbe for their outstanding artistic contributions. More recap manana. A lot of other thank you’s and I don’t want to miss anyone. Elmo taking the Little Goblins Diaper Dash through their paces. For the first time our Little Goblins outnumbered our adult entrants, we couldn’t be happier! Elmo was also this year’s Bar None Beer Mile Champ. And he’s run a half marathon in it. Photo by Paul Baltes. This entry was posted in Uncategorized on October 26, 2013 by runguru. I’m pretty happy with the 150 or so entries for tomorrow’s Vala’s Monster Dash & Little Goblins Runs. With four other runs on Saturday and 6 other runs on Sunday its hard to be disappointed. What I really like is the number of Little Goblins we’ve got signed up. Linda and I have been committed to the youth of the Omaha Metro for over 8 years now, both in our programs and our events. Providing either free or low cost opportunities to get the kiddos out from in front of (insert their favorite screen). At $15 the LGR includes a medal, pumpkin, day pass into the patch and refreshments. My Good Buddy Tom Whitaker sat with me for 5 hours last night at Peak Performance (Thanks Mike!). We distributed packets, signed up a few stragglers, and had a jolly good conversation. He’s always given good counsel (not that I’ve always taken it). Something of a 180 pound Jiminy Cricket if you will. Back to the Dash. I didn’t do a whole lot of advertising or promotion this year. No flyers at Zorinsky, didn’t stuff a single windshield. Hoping that the event’s reputation has established itself, and it has. A Family, Fun, Fitness event. And we are the USATF Nebraska Assoc. 5K XC Champs. I had to work hard for that designation believe it or not. Since founding the LDR program in Nebraska in 2002 I have hosted dozens of assoc. champs. Dozens. Building the LDR program one race and one year at a time. There is a fee for sanctioning ($65), the USATF medals were another $150. Not that big of a deal but still shows support for OUR program. For four card carrying USATF members. Three from Team Nebraska (Doherty, Cross, Stack) , and just this morning I signed up our women’s winner, she runs for NRGE (Heil). As I told Andrew Jacob of the Lincoln Running Co. Racing team this morning if I thought doing a tap dance would help boost USATF registrations I’d have my shoes on right now. It is critical to the USATF Nebraska Association that we hold Championship events across as many distances and disciplines as possible. Roads, Track, Mountain, Ultra, Trails, and Racewalking. If we do not host a minimum number then we are at risk of losing our accreditation with the National Office. I take this very seriously. This will be the first year since 2002 that we will not meet the minimum and I’m betting it will be the last. I have that much confidence in a young man I’ve never met, Michael Rathje. I believe he will continue to educate himself, listen to the right people, and do the right thing. The PERFECT place to accomplish this will be Dec. 4-8 in Indianapolis at the USATF Annual Meeting. What else? I actually lowered the entry fee. Last year the entry was $40 early and $45 race day. This year I kept it at a clean $35 no matter when you enter. Why would I do that? Because the arena is getting more competitive. And because I have always been about showing the runners the Very Best time and the Very Best value for their entry dollars. Its more about the runners with me, making sure they are shown a good time, that is why no promotion was necessary this year, word is out. And it doesn’t hurt to have the Omaha Metro’s premier fall attraction as a sponsor. And all the Good Clean Living I did this year is being rewarded with the Perfect Morning. This entry was posted in Uncategorized on October 25, 2013 by runguru. Going to be a very busy little bear for the next 3 days. Count all the bees in the hive, chase all the clouds from the sky. I’ll post something either really cute, or else, today and tomorrow. And a complete recap of the Vala’s Monster Dash in special Saturday and Sunday editions of RGS. This entry was posted in Uncategorized on October 24, 2013 by runguru. We are frighteningly close to this weekend’s Monster Dash and Little Goblins Runs. Thank you for registering! Here are a few details that will help make your run more fun. Online registration will remain open through midnight tonight. www.active.com keyword: Vala’s Monster Dash. Packet pick up and late registration will be held Thursday, Oct. 24 at the new Peak Performance on 168th & W. Center from 3:00 to 8:00 pm. Please try and make this packet pick up to help alleviate lines getting into the Pumpkin Patch Saturday morning. Race day packet pick up and registration will open at 6:30 am at the main entrance to Vala’s. T-shirts will still be available while supplies last. The Monster Dash 5K Run/Walk will begin promptly at 7:50 a.m. The course is cross country, meaning it is run on the trails and paths through and around Vala’s. It is a 2 loop course. We will have caution tape and arrows to make sure you don’t lose your head! We will have official times for all participants. Thank you to Tom Whitaker and the Omaha Running Club for their generous support. 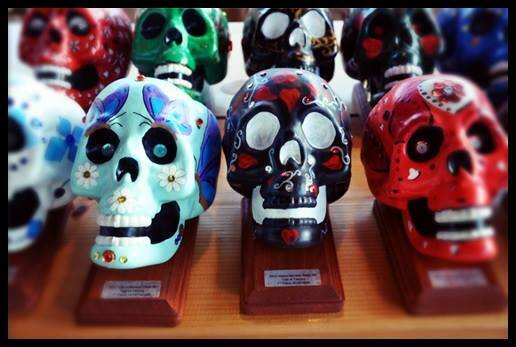 Awards will be handed out to the top 10 men and women as they cross the finish line, Agustin and Dan have outdone themselves this year with some fantastical and whimsical skulls. All finishers will receive a commemorative medal. The Little Goblins Runs will begin promptly at 8:50 at the Pavillion. 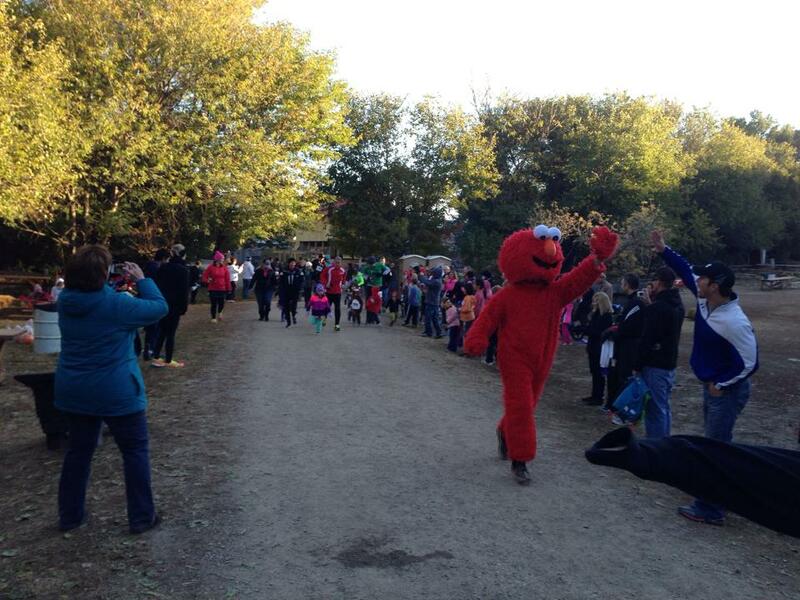 Elmo will make a special appearance as our lead runner for the Little Goblins. Distances are 40 yard Diaper Dash, 400 meters and 800 meters. All Little Goblins will receive a pumpkin along with their medal. The 3-Legged races will trip off at 9:10. These are a blast! Please bring your own “ties that bind”, runners will be tied at the knees. Torn sheets work wonderfully. We will have hot chocolate, fresh fruit, and donuts post race in the Pavillion. Thanks to Hy-Vee for the fruit donation and to Sunrize Donuts for the confections. The weather looks to be perfect! But please do bring a change of clothes and take advantage of the day pass into the Patch. You will also be given a wristband as you check in Saturday morning that will allow you to return to the Patch if you decide to go home and freshen up (or catch the Huskers!). 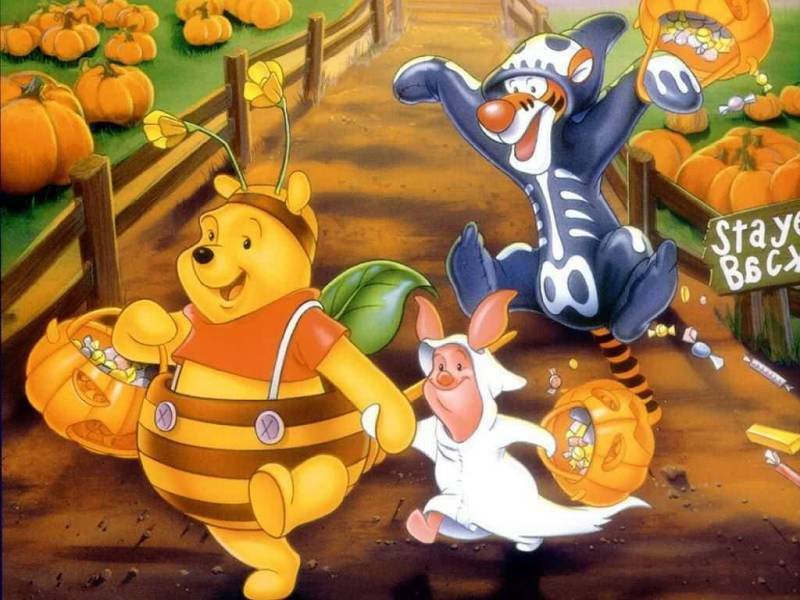 Thanks again for signing up and we look forward to a Spooktacular time! Come on, you know you want one of these custom made awards. Fall Family Fun! We are proud and privileged to have Tim, Jan, Kyla, & Uriah on board with the Monster Dash! This entry was posted in Uncategorized on October 23, 2013 by runguru. Yesterday’s comment of the Real Team Nebraska set off a firestorm of emails, some got it and some didn’t. The dividing line across the board seemed to be tenure on the club. Get this: Original is synonymous with Real. And before another word slips from substantia gresia to keyboard: All due respect to all but a couple of the current athletes. What I wouldn’t give to have young Colin Morrissey and Ashley Miller and stalwarts Eric Rasmussen and Luka Thor back under my wing. And many others, they know me and know who they are. Here’s why I didn’t sleep last night: When I woke up yesterday and checked the results for the Des Moines Marathon, and saw where Luka ran 2:26, I immediately felt sick. Confusion first, not really believing, then disappointment. Then I got upset. And then I called Luka. And got the straight story. I’m calling b.s. on this. It was not amazing. He didn’t rock it. He was not ready. Luka’s longest training run going into this marathon he should never have run was 16 miles. Glen, are you reading this? I was bringing Luka along with kid gloves. Doing everything right to make sure that when he WAS REALLY READY to run a marathon, that he would get the 2:16 Olympic Trials qualifier. How was I doing that? By insisting that he hold off racing 26.2 miles until he had achieved the sub 1:05 half marathon he is so very capable of, a time necessary to run a Legitimate marathon (legitimate relative to his vast talent level). 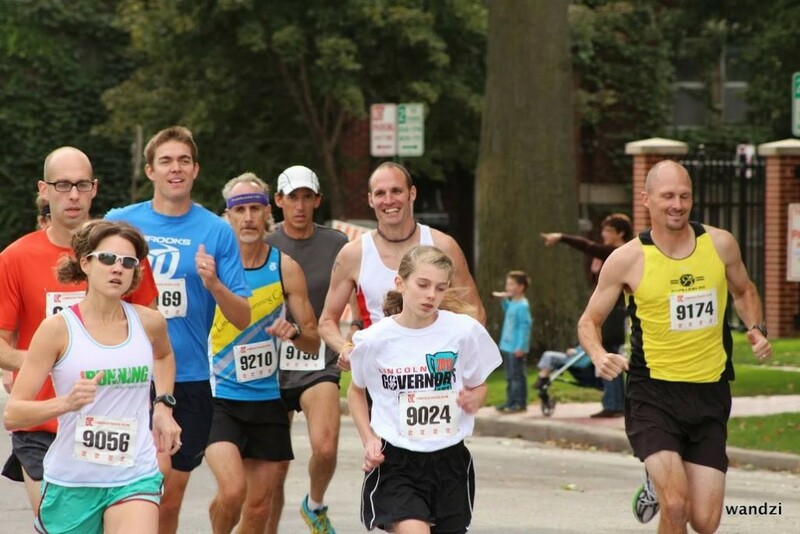 Contrary to Megan’s position, this Des Moines Marathon was not run on a whim. Luka was underprepared. He was not physically or psychologically ready. Add to that the fact that instead of having an Elite Entry into the field he was assigned a regular (and he’s not regular folks) bib. And even more inexplicably, it was decided that Kelly would drive Luka to Des Moines Sunday morning. Three hours of sitting in the car, that early in the morning, before what should have been a Major Effort. Are you starting to see why I was sick to my stomach? Luka knew better. But he has always been a team player and took some, in my opinion, bad advice by the current “leadership”. And before you assume that I’m piling on Kelly and Megan and York: I’m not. I’m describing the difference in philosophies. I’ll refer back to my nearly 30 years of athlete development. To my successful track record of bringing athletes along with their best interest at heart. 30 years experience being trumped by a couple of 25 year olds and a well intended if misguided president. You can see now why, after I personally and mistakenly empowered them, they threw me off my own club. And of course I’d be remiss not to mention Tim Langdon’s role (It’s in your best interest Weel). Guess I’ve covered everybody now. Which prompts me to offer the following: Any athlete, representing any club, on either side of the river, is welcome to contact me with the promise of my utilizing my experience, resources and contacts to advocate for a better way. If you are Really Ready, there’s not a marathon in the country that I can’t get you a hotel room, elite entry, meals, etc. I gladly and freely offer this for those of you that dare to dream. Agent of change. Do you read me? Loud and Clear. Not Over, and Not Out! Thanks to wandzi for the photo I lifted off of facebook. Several of my former Team Nebraska runners (the three smiling) at this past weekend’s Governor’s Cup, part of the tallest team ever. None still run for the club from the looks of their kits. Interesting to see Craig Christians running for LRC. A great addition to their masters corps. He’s run the gamut from Team Nebraska to Ndorfnz, and now LRC. Let’s hope its finally a happy fit. 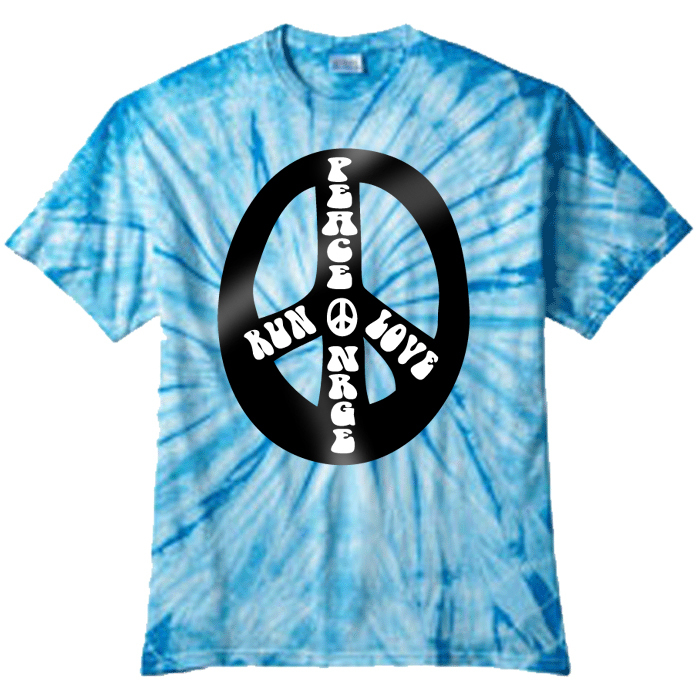 This entry was posted in Uncategorized on October 22, 2013 by runguru. Big Congratulations to Lindsey Brezenski at yesterday’s Des Moines Marathon! She ran a 10 minute personal best, (3:18:26) finished 17th overall woman and 2nd 30-35 age group. Her future’s so bright she has to wear NRGE Shades! My boy Luka Thor made his long anticipated marathon debut in Des Moines finishing 7th overall in 2:26:38. You just wait until he isn’t working midnights and taking a full load in nursing school. Damn proud of you son! My old mate Jeff Nielsen ran 2:42:47 for 18th overall. Both still represent Team Nebraska, I’m proud to have brought them along. Eighty-two year old Ed Whitlock of Canada set a WR last month running a 1:38:11 Half Marathon. At yesterday’s Scotia Bank Marathon in Toronto he set another by cranking out a 3:41:58. My Canadian correspondent reports that he isn’t a rockstar, wear a cape, flex his biceps at finish lines, nor chirp in woots. I’d like to say he’s my old buddy but we’ve never met. A few weeks ago I detailed Sylvia Ruegger’s Canadian National Marathon Record of 2:28:36 set at the 1985 Houston Marathon. At yesterday’s same Scotia Bank Marathon, Lanni Marchant finally bested the mark by turning in a sterling 2:28:00. At 61 years of age my old buddy Doug Kurtis, he’s another notion knocker. 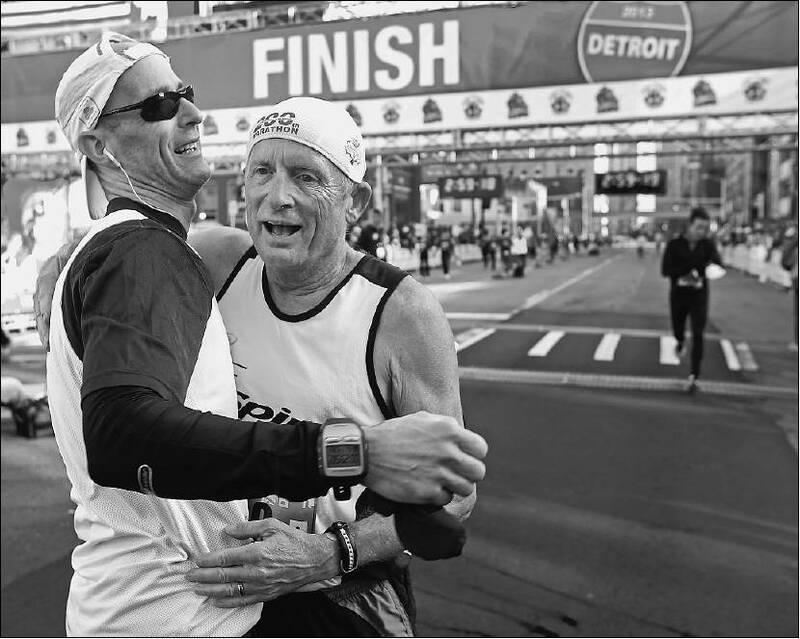 At yesterday’s Detroit Free Press he ran his 200th sub 3 hour marathon in 2:59:03. Let that sink in a minute old buddy Dave. 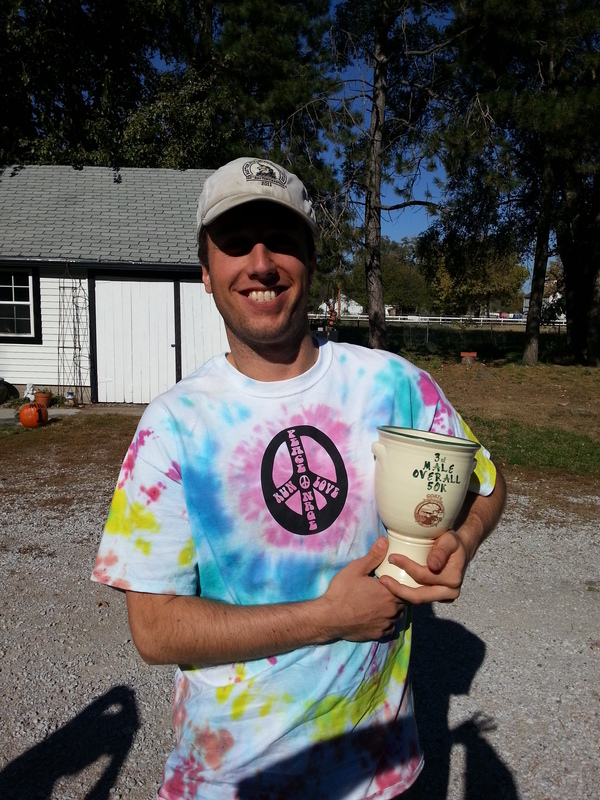 Our mate Jerrod Anzalone had a good race yesterday at the Governor’s Cup 15K. 4th Overall behind LRC’s Eric Noel, masters stud Ivan Ivanov, and York Thomas. Right in the mix with much more work to go. In the accompanying 5K it was like a throwback to the Real Team Nebraska days with three of the Original Barefoot Striders showing well. 35 year old Dustin Llewellyn 2nd (16:29), 34 year old Shannon Stenger 3rd (17:01), 32 year old Paul Wilson 4th (17:31), and Craig Christians 5th (17:49). Talented 10 years ago, talented today. A big tip of the sombrero to Kelly Hennen too! A two minute personal best in the 5K, that is 4 minutes she has knocked off her pr just this year. Helping others achieve their potential has no equal in satisfaction. More than makes up for dealing with the knuckleheads. Doug Kurtis, is there really anything else to say? This entry was posted in Uncategorized on October 21, 2013 by runguru.